Then, last September, when I got my flash of inspiration to start spending hours a day at a keyboard (that's how it went) I started thinking of the mysterious organism called the beta reader, the one who had all the connections to the people with the cool books in need of a new mind to critique them. Seriously. Who wouldn't want to read a book for free and give an opinion on it that the author will actually take into consideration before publication?!? Beta-reading excitement aside, is that really the only reason why we beta read novels? *cue writerly groans* I know. (Almost) every writer hates. editing. period. So why should we sign up and sacrifice a month or more of our time to edit someone else's novel? Does editing even have to do with beta reading? Note: probably not. Not every writer is going to ask for in-depth feedback. But if they do, then you have an opportunity to try out your editing skills on someone else's novel. Why isn't this scene working? How can it work better? Or WHY IS THIS SCENE SO AWESOME!?!? A major part of editing is figuring out what works, what doesn't work, and why that is so. As a beta reader, you're helping the author figure all that stuff out. But the awesome thing is: you just find the problems, you don't have to fix them. Which, if I may be so bold to say, is the reason why we hate editing: we like finding the problems, but we hate fixing them. With beta reading, we have another chance to put our problem-solving skills to the test without actually having to carry out the fixing part. (aaannd I bring up something else we all hate) Criticism. Is. Scary. There is nothing worse than someone saying they dislike a part of our novel, or even indicating how horrible it is, despite how we brutally critique our own work. We know what it's like to be on the receiving end of criticism, even if it's only from ourselves. But... what if we're the ones giving the criticism to someone else? Suddenly, it's a whole different ball (writing) game. We know what it's like receiving criticism. And we're afraid to give it to someone else, knowing how horrible it can feel. This is the #1 problem I run into when I beta read: wanting to give honest critiques without sounding blunt or negative to the writer. It's a tough thing. In the end, we're going to have to craft our feedback so it's aimed at the book's issues and potential. We have to look at the positive parts of the book, and encourage the writer to use more of those in the not-so-good parts. So how does that help us as writers ourselves? Maybe we are definitely being too hard on ourselves. Critiquing someone else's novel gives us the opportunity to be honest but positive, giving direct but encouraging feedback. Don't you think that's something we need to do with ourselves, rather than down-talking our work and saying it's all horrible? Yep. Learn how to encourage yourself, look on the bright side of your work, and give criticism that helps the writer and the novel without crushing them. In other words, it's a community. We're all boosting each other along toward our dreams. Critiquing a writer's novel is helping them, just as you're helped when someone critiques your novel. Quick story: About a month ago, I received my novel, Found, back from beta readers. I'd say that was a turning point in my writing journey. I finally knew what worked and didn't work in my novel. I'm forever thankful to my awesome beta readers who have helped me so much. That's a cool thing to be a part of. Writers value beta readers perhaps more than anyone else because of how great a help they are. 2) do I know this writer? It's awesome to give friends a boost by beta reading their novels. 3) is this a genre I'm interested in? I usually don't judge a novel by its synopsis, since they are so hard to write, but I do check out the genre. Murder-mystery? Nope. Romance? Probably not. I like to beta read genres I'm semi-familiar with and comfortable reading. 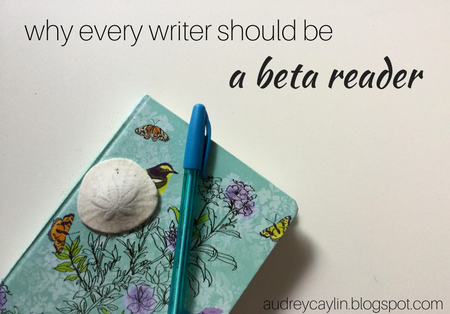 But, most importantly, will beta reading for this person boost their writing journey along? It's awesome to help other writers along in their journeys, especially if they're newer to this whole field. It's a really special feeling, knowing you helped someone, and that alone is worth reading their novel and critiquing it. You never know when your words are going to make huge difference between a writer giving up and carrying on. And, lastly, why not beta read? You get to check out an awesome idea by another writer, give some advice about it, and flail over it with the author (which is awesome xD). Without feedback and support, no one's novel would ever get published. And who knows? Maybe you'll be inspired but the words you read. Have you beta read before? What's your favorite part? I completely agree! So many authors / writers / creative people of all kinds do say that the best way to learn how to edit, etc. is to beta read other people's work. IT'S ALSO SO MEANINGFUL TO WRITERS, TOO. I USED TO GET JEALOUS OF BETA READERS TOO. XD I was sooo envious. But now I've got SO MANY books I'm alpha/beta/anywhere-in-between reading it's insane. *cough cough* Because I love it so much and...I hate saying no to people. >.< I over-commit way too much. Half the time I have it that I critique someone's short story and then other people see it and go "OMW CAN YOU CRITIQUE MINE TOO" "AND MINE" "PLEASE YOU'RE SO AMAZING AND I REALLY NEED HELP" and I honestly just can't say no. It's really bad. XD But I'm trying to be better at saying no because I haven't got the time. BUT YES. Critique reading is the BEST. All these reasons are so true, and I can testify to that. *wise nod* And it's honestly such an amazing privilege. I've never beta read before, but my book will be ready for alpha readers soon *gulp* This is extremely great, thank you for this post! I always love reading what you have to say, Audrey! Beta reading is one of my favorite things EVER - I honestly love editing so so so much (*cough* solongasitsnotmynovel *cough*). Problem is, there's this thing called TIME that stops me from editing 5 different projects in the same month :D. But I love going through another person's raw story (because, admit it, even if raw is messy, it's also beautiful) and helping them tie together the loose ends. Much fun-ness ;). Hahah that criticism... Something I love getting but find it hard to give (I never know how much of that I should give). I find bate reading to be quite fun, I've only beta read about three books (including yours) though. Kinda sad I couldn't give more feedback but you know life. I honestly want to see what my beta reads will think of my novel. Oh, wow, this was great! I have beta read before. Your novel "Found" was one of the first ones, and the first that I signed up for. :) I like helping people so when writers ask for beta readers I practically jump at the chance to help a fellow writer make their book better. But I'm still working on giving criticism. To be perfectly honest, I can be quite blunt sometimes even though I didn't mean to be. But I'll get better the more I do it. beta reading is the best! it's way easier to "edit" someone elses work when it's fresh to you xD I've beta read twice and should have done more - I didn't know what I was missing out on haha. lovely post! OH HEYYY LOOK WHO ELSE POSTED ON BETA READING TODAY XP Seriously though. Did our brains sync for a moment? Also, I really like your last point on if you beta read a book or not. If you know it's not really in your genera, you probably won't be too much help. But sometimes it's hard to listen to that sound logic when it's a friend's book or something that just looks REALLY good. TRUE. I think as writers, we're definitely a bit shy showcasing our writing because criticism is hard. But how do we know that our target audience can connect and how can we move forward through the writing process without moving past our fear? This is such good timing! I'm almost finished editing my novel and rewriting chapters, and trying to write for NaNo while also taking an online class over the summer is going to be stress stress stRESS. I HAVE THE SAME PROBLEM. People are like "beta readers!" and I'm like "I'll do it! I'll do it!" XD And then I realize I have no time for all of this but I really really want to give them a good critique, so there goes my time to breathe. Oooh congrats on that! :D It's going to be awesome. Seriously, alphas are the best. They flail about your novel and are the most encouraging first critics! Yes! Before I had my novel beta read, I knew that the writer really appreciated it, but after my novel was beta read, then I really knew, if you know what I mean. The rewrite I'm doing right now wouldn't have been possible without their feedback. Eeep, yes, your feedback has been very helpful! :D And I totally understand with the being blunt thing *nods* I know that I can get that way myself (though I don't mean to sound that way). It just takes a little practice to find the balance between blunt and honest. omw I think it's the best thing when you follow someone and hear all about their novel, and then you finally get to read it and give feedback! eeep, thank you! <3 <3 I'll definitely check it out! Um... they must have xD I just read your post and was like "wow, Hannah posting on beta reading stuff too!" That's awesome! And we can definitely learn from the novels we read. I love it when I'm reading along and see some cool style or twist that inspires me! Beautifully said! Beta reading is the perfect opportunity to test the waters of our future audience and become more fearless in our writing.